KRACH is short for “Ken's Rating for American College Hockey.” Ken is Ken Butler, a statistician, and the mathematical model he used is known as the Bradley-Terry Rating System. The system and its details are well documented in great mathematical detail online (see KRACH explanation at Ken Butler's homepage). The KRACH rating system is an attempt to combine the performance of each team with the strength of the opposition against which that performance was achieved, and to summarize the result as one number, a "rating", for each team. The higher the rating, the better the team. This system accounts for strength-of-schedule (SOS) as it ranks the teams. Teams with equal records and differing SOS can quickly be ranked as a result (i.e. team with stronger SOS is ranked higher than other teams with same record and weaker SOS). The ratings are calculated purely from the game results (win, loss or tie), and do not use the goals scored at all. Overtime wins count as wins. Ties, for KRACH's purposes, count as half a win and half a loss. 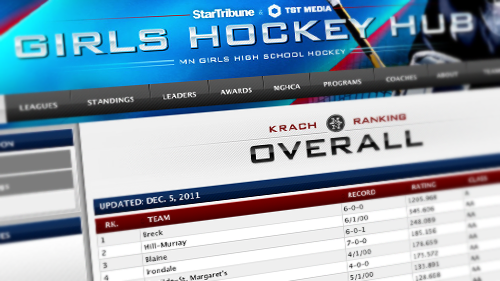 KRACH only counts games against Minnesota State High School League opponents.